that is EASY to Integrate with your ERP ! SolutionCorp is a premier software development company delivering full featured project time and expense tracking system. Our eTime+Projects system features an easy to use flexible cloud timesheet with detailed project estimation bundled with a rich library of project costing reports. Your directors and project manages have complete visibility to customer and project information. eTime+Projects is setting the standard for cloud based project Time & Expense Tracking systems. Budget & Plan your projects for labor, expenses and overhead. Our Cloud based timesheet lets you easily track employee time & expense by Project. 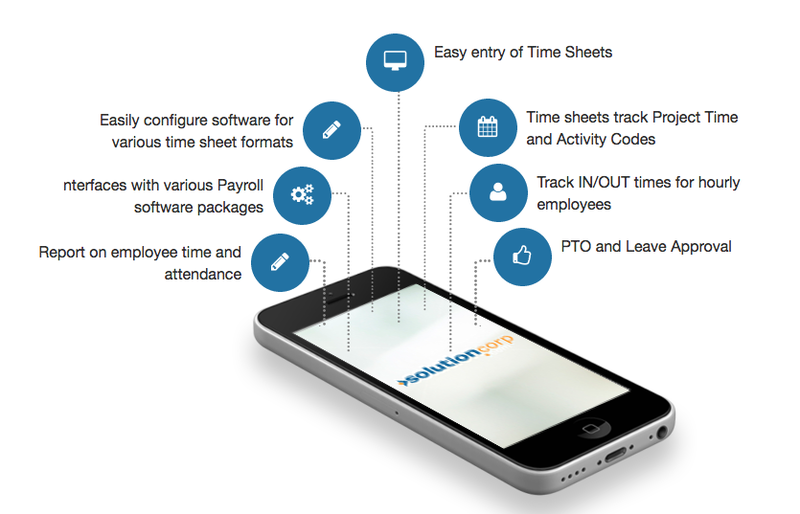 PTO & Leave Tracking tool integrate with eTime+ timesheets. From within a single system easily track and schedule employee paid time off. This Fully Web Based system allows for detail Customer Management. The system tracks all customer relations and provides easy methods for eCommerce Integration. Time+Projects provides concise methods for integrating with your existing ERP systems. Data import/export tools allows for seamless integration with external sources of project, customer and employee data. SolutionCorp Time+Projects software suite features a user-friendly online timesheet providing a robust entry system for tracking employee project time and expenses. Our budgeting module features a tool for detailed cost estimation for a complete estimate of project labor & expense costs. From within our time tracking system you can achieve a high level of integration with your existing ERP and accounting systems. From our project portal you will have complete picture your project time and expenses. Our complete system can be delivered to your team securely from the cloud. Our cloud based Software as a Serivce (SAAS) is an excellent choice for cost effective solutions. For over 20 years we have provided web based delivery of our products. We are dedicated to providing software solutions that are so cost effective that your Return-On-Investment is practically immediate. We also provide self-hosting license options. Our team of software developers, architects , and implementation specialists can assist you in all facets of full system implementation. We are dedicated to achieving highest level of project reporting and ERP integration. Our portals can be customized to facilitate complete project reporting visibility and monitoring. Our unique portal scheme is ideal for disseminating important project information to account leaders and project managers. With our ability to integrate all external ERP systems, the eTime+ project portal can prove to be a valuable tool for managing all project costs and associated employee activities. Complete project reporting portal ! A sample of SolutionCorp users for our web time sheets, project management and CRM tools. SolutionCorp’s online Timesheet system is one of the best web based timesheet for tracking employee time and expenses. The system streamlines all facets of employee time entry. If you need to track labor costs by project or client , then the SolutionCorp timesheet should be your first choice. Project Costing tool successfully integrates Project Planning and Estimation, Employee Allocation, Time and Expense Tracking, and Client Reporting. We provide your project managers with a real time window into accurate project, employee and client project cost information.